"Love is the essence of the Christian life. There is nothing deeper than that." "The main reason so many of us are struggling stems from our definition of success." "Success is being faithful with what we have." "The only way we can escape criticism is to say nothing, do nothing, and be nothing." "We must not succumb to the temptation to do anything for anyone other than what our God has commanded." "Strategically, Jesus pulled away from the crowds to rest and rejuvenate." "Date nights don’t have to be grandiose, just consistent." "If our attendance growth comes at the expense of our ability to disciple people, we have not been successful." "Busyness does not equal effectiveness." "Too many of us are condemning other leaders simply because we’re insecure in our own skin. Jealousy breeds condemnation." "Just as it was with Jesus, our team is our first ministry responsibility." "How can we expect others to listen to our instruction if we don’t even fully pattern our lives after Jesus?" "I know we often think that if we leave a situation alone, it will go away. It is just not true." "If all our focus is on building bigger crowds, we are simply not building the church." 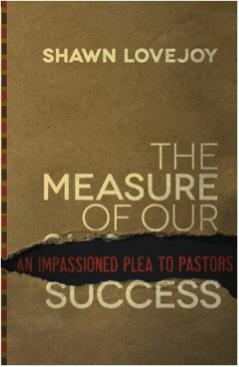 All quotes were from Shawn Lovejoy in his book: Measure of Our Success, The: An Impassioned Plea to Pastors. You can purchase his book here.